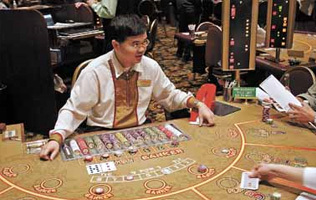 Baccarat can be characterized as a casino card game that is in some ways similar to blackjack. In this game 2 or more gamers play against the banker. The highest score that can be reached in this game amounts to 9. Baccarat is considered to be a very simple card game with three available outcomes: player, banker & tie. These are just alternatives and gambler can make stakes on them. Where Did Baccarat Come From? There are a lot of legends about baccarat. World gambling history has influenced another very interesting game - baccarat evolution can be seen since over 2600 years ago with the ancient Roman Etruscans who settled in Italy. They worshiped nine gods who lived in Temple of Golden Hair. There was a ritual that was conducted with the help of dice with nine sides and determined the fate of the young maidens. If the throw resulted in 8 or 9 the girl was promoted to priestess, if dices showed 6 or 7 she was banished from all religious rituals. But if it was 5 or less she had to walk into the waters of the sea and drown. The word "baccarat" is originated from Italian language and meant "zero". The origin of baccarat still remains very obscure and many European countries argue about the predecessors of this hazard game. It is really difficult to define the sources of baccarat as far as its variations can be found in different regions: for instance, Spanish Punto Banko or French version of this game translated as "way of iron or railroad". The second game was named like this because the playing cards were laid down in an iron box. The truth is that the origin of baccarat game is really quite darkened although it is common knowledge that baccarat roots back to the Middle Ages. It is believed that this particular gambling game enriched land casinos prospects when it was introduced in Italy and in France in the period of Charles VIII governing France (1483-1498). This game is compared with Faro (also known as Pharaoh or Farobank) and Basset - popular gambling card games in France in 17th century. It was also played with the participation of banker and several gamblers and the gaming tactics is very similar.